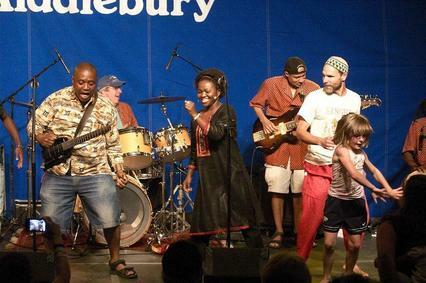 ​Middlebury Festival on the Green! Visit our 2019 Festival Performer Line-up page for artist information, videos and websites! There's plenty of room under our big tent. Never let a possibility of rain stop you from coming. ​distance from the green. Get a meal to go and have a picnic! Middlebury Ambulance will have hot dogs, snacks and ice cream. “Brown Bag Specials,” performances designed for a family audience, are presented at noon Monday through Friday. Festival-goers bring a bag lunch or picnic from home, or patronize one of the nearby restaurants for take-out. 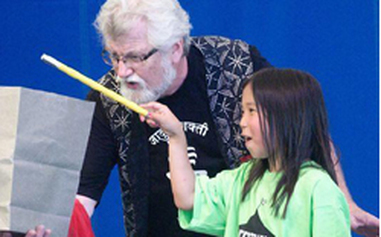 These shows, which feature storytelling, dance, music, and puppetry, are enjoyed by an audience sprinkled with lively toddlers from local day care centers, youthful residents of nearby camps, downtown shoppers. All events take place rain or shine under the big tent at village town green bordered by Rt 125 Main Street/Rt 7 and Merchants Row. ​Click here for the brown bag schedule and scroll down. There are two evening performances, 7:00 and 8:30pm with two different musical acts! The week's program features something for nearly every musical taste drawn from Vermont and international touring artists. A menu of music including folk, jazz, world, bluegrass and much, much more! ​All events take place rain or shine under the big tent at village town green bordered by Rt 125 Main Street/Rt 7 and Merchants Row. Click here for the week's music schedule. Since 1984, our capstone event has been the Street Dance, featuring big-band selections by the always-popular Vermont Jazz Ensemble. The Vermont Jazz Ensemble is a 17 member instrumental music group that performs music, most of which is in the jazz or big band style. This is a wonderful event for the whole family. Come early and learn some dance steps from Jim Condon! Main street will be closed from Merchants Row to the post office for the dance. The venue address is 3 Park Street, Middlebury 05753 on the town green right next to St. Stephens Church.